Christina Lopez is a 35 year old transgender immigrant who has been in immigration detention for a year and a half. She is currently detained at the Santa Ana City Jail in need for medical attention for Hepatitis C, which so far the detention center has refused to provide despite several requests. Christina left Peru following her parents, who had traveled to the U.S. to find better economic opportunities. In addition to wanting to be with her family, emigrating was a matter of life and death for Christina, as an attempt to escape harsh violence against transgender people in Peru. Christina grew up with her mother and two brothers. Before she was in detention, she was took care of her 32-year old brother, who is autistic. He needs around the clock supervision, so Christina would watch him while their mother worked. Her detention has been extremely difficult for her brother, and her entire family. But Chrsitina’s adjustment to the U.S. was not easy. As a transgender woman she had little support from her family and few access to resources. She became involved in an abusive relationship, which lead to at least one documented case of physical violence from her partner. She also began to have a drinking problem, during which received 3 driving under the influence charges. The latest charge, in 2012, is what led Christina to be detained and put in deportation proceedings. LGBTQ and immigrant rights organizations under the #Not1More campaign, including Familia QTLM, GetEQUAL, the Transgender Law Center, and the are organizing to support Christina’s release calling attention to how her experience shows the repeated failure of the immigration enforcement authorities to meet the needs of transgender women in detention. Even with the recently released guidelines, Christina’s conditions would not change in the detention center. Christina’s story is an example of how ICE cannot guarantee the safety and minimum dignity for immigrants, in particular of a transgender immigrant with particular health care needs. The agency needs to use prosecutorial discretion to release Christina from detention. 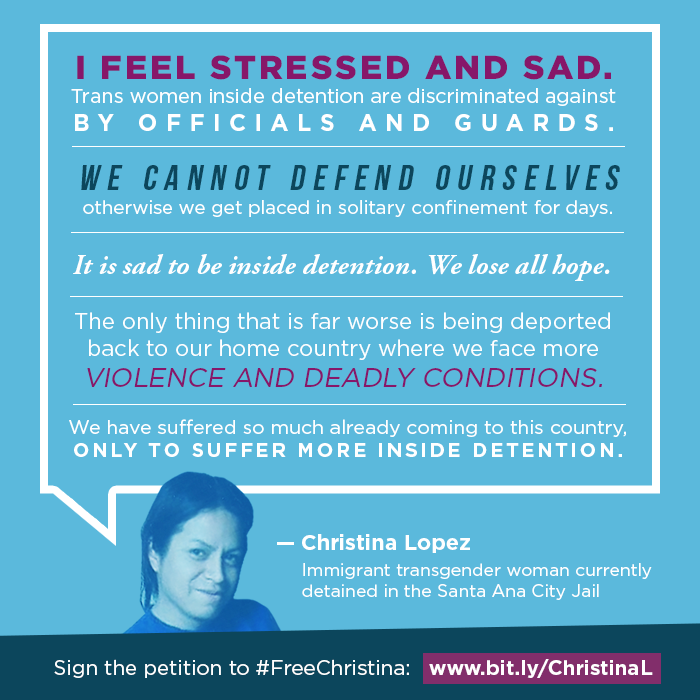 Please sign below to tell ICE that Christina should be released from detention! I am writing concerned about the case of Ms. Christina Lopez (“Samuel Lopes Christian” in your records, A 095-75-3915). Ms. Lopez is a 35 year old transgender immigrant woman who has been in immigration detention for a year and a half. 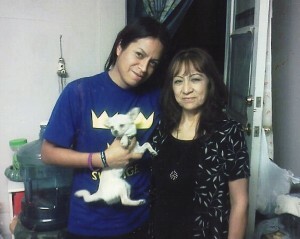 She is currently detained at the Santa Ana detention center, in need for medical attention that she has not received. She is one of many transgender immigrants in detention centers whose needs are not being met. Therefore, I am writing to urge you to use prosecutorial discretion to release Ms. Lopez and allow her to go back to her family, and receive the medical attention that she needs. Ms. Lopez left Peru following her parents, who had traveled to the U.S. to find better economic opportunities. In addition to wanting to be with her family, emigrating was a matter of life and death for Ms. Lopez, who wanted to escape harsh violence against transgender people in Peru. Ms. Lopez grew up with her mother and two brothers. Before she was in detention, she was took care of her 32-year old brother, who is autistic. He needs around the clock supervision, so Ms. Lopez would watch him while their mother worked. Because of this role, her detention has been extremely difficult for her brother, her mother, and her entire family. Ms. Lopez is also a survivor of domestic violence. She became involved in an abusive relationship, which lead to at least one documented case of physical violence from her partner. I am a ware that at that time she also began to have a drinking problem, and received 3 driving under the influence charges. I understand that these are serious charges, however, I urge ICE to consider the totality of the circumstances in her case, and allow her to recover and address alcoholism in her community. It is also important to highlight that Ms. Lopez’s experience shows the repeated failure of the immigration enforcement to meet the needs of transgender women in detention. Even with the newly released guidelines, Cristina’s condition would not significantly change in the detention center. I urge you to re-consider her detention and use prosecutorial discretion to release her to her family.